One of the first things potential homebuyers will notice about your home is the exterior. Yes, it is extremely beneficial to have a well-manicured lawn, but their eye will go beyond the flowers and the trees. Hanging, broken and overflowing gutters are an eyesore. 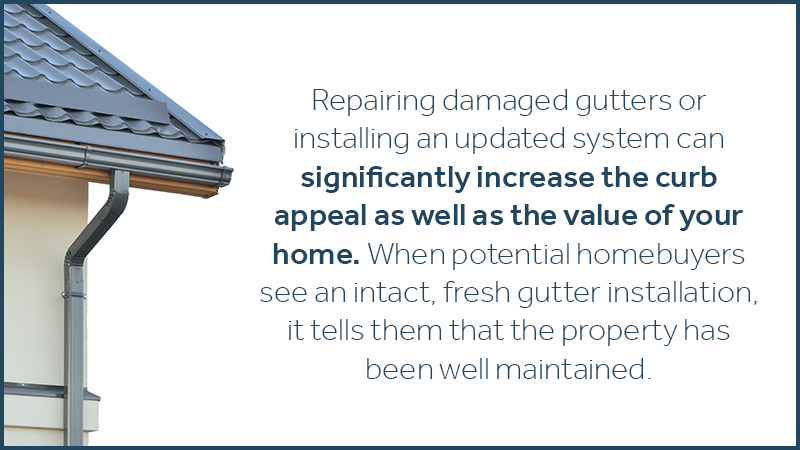 Repairing damaged gutters or installing an updated system can significantly increase the curb appeal as well as the value of your home. When potential homebuyers see an intact, clean gutter installation, it tells them that the property is well maintained. The gutters are designed to prevent water from seeping into your home. If the gutters are clogged or damaged, the water has nowhere to go but under the shingles or through the foundation and into your home. When the water seeps in, it typically puddles inside of the walls and ceilings for quite a while before being noticed. This eventually leads to mold and mildew. 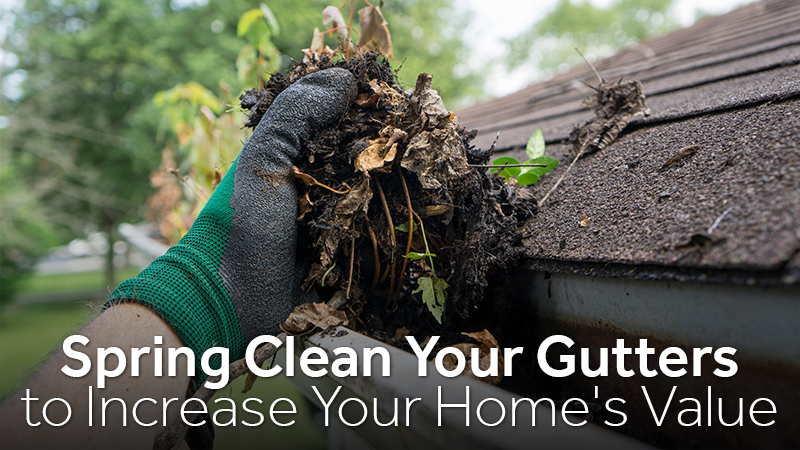 Keeping the gutters clean and well-maintained can help you avoid these costly repairs. The first thing to do is to clean out all of the leaves and debris that have built up in the gutters and downspouts. Carefully inspect the gutters and eaves for any leaks, cracks, missing parts or damaged pieces. If you notice any rust or other significant damage, replacements will be needed. Check the downspouts to ensure the rivets are secure and drainage area below the downspout is clear and far enough away from the house. Once you have removed all of the debris from the gutters and downspouts, you can use the garden hose to wash away the dust, grime and dirt. Turn the hose on full force and aim the water through the gutter, be careful to not spray directly under the gutter, on the house and down towards the ground around the foundation. After rinsing the gutters, force the water directly through the downspouts to make sure there are no clogs. After cleaning the gutters and downspouts, make sure there is no debris left on the roof that may end up in the gutter system. It is important to inspect the gutters at least twice a year; once in the spring and once at the end of fall. Remember to wear heavy-duty gloves when cleaning them to avoid getting cut or picking up something unpleasant. When using a ladder, make sure it is well-footed and in good condition. If you are uncomfortable with heights or concerned about completing the task yourself, it’s okay to hire a professional. If you do decide to move or if you simply have clutter to remove from the house during this year’s spring cleaning, contact Zippy Shell of West Houston. We’ll be happy to help you with your packing and moving needs!